Domo, the SaaS business intelligence startup launched by Omniture founder Josh James, has raised $60 million in new funding, we’ve learned exclusively. The round was led by GGV Capital with Greylock Partners; Bezos Expeditions, the personal investment company of Jeff Bezos; co-CEOs of Workday Aneel Bhusri and David Duffield; Founders Fund; and Mercato Partners all participating. Omniture is a web analytics SaaS company that went public and was subsequently bought by Adobe in 2009 for $1.8 billion. In 2011, James debuted Domo, with $33 million in funding from Benchmark tackling the business intelligence space. Domo has also purchased a company in the past called Corda. Domo has been relatively quiet about its product, besides to announce the funding. In fact, Domo has yet to be released to the public. So what does Domo do? The company puts BI in the cloud, but in a scalable and easy-to-use format so people can actually make sense of (and make money off of) massive amounts of business data. 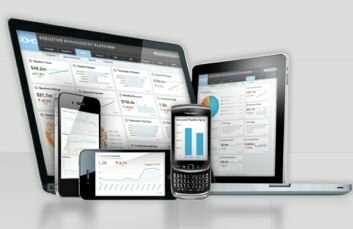 The application is able to analyze business data and display it in a user-friendly and realtime format. After selling for only six months, Domo already has more than 100 revenue-generating enterprise customers across numerous industries, including media and marketing, telco, retail, travel and leisure, technology, financial services and professional services. And James isn’t shy about his goals. “We want to do what the iPhone did for mobile to the enterprise world,” he says. James tells us that the software as a service takes all the data in an organization and puts it into a platform that allows you to interact with data in a way executives have never been able to do. “Domo eliminates meetings, creates data intelligence, and turns that data into real information that users can share and collaborate on,” he says. For example, a Fortune 500 retailer is using Domo to see what colors of products are selling in realtime, and adjusting manufacturing and supply chain management in real time. James says that prior to using Domo, the company had to wait months to analyze sales data and then make changes in other business areas. The product will be coming out of private beta in the coming year. As for why James decided to raise funding at this point, he says he’s “strengthening the balance sheet in preparation for our next phase of growth.” But when starting the fundraising process, investor interest was overwhelming, and the company raised twice the amount they intended to raise. In fact, Domo ended up turning away more than $50 million in additional funds for this round. “I want some freaking sales reps,” concludes James.